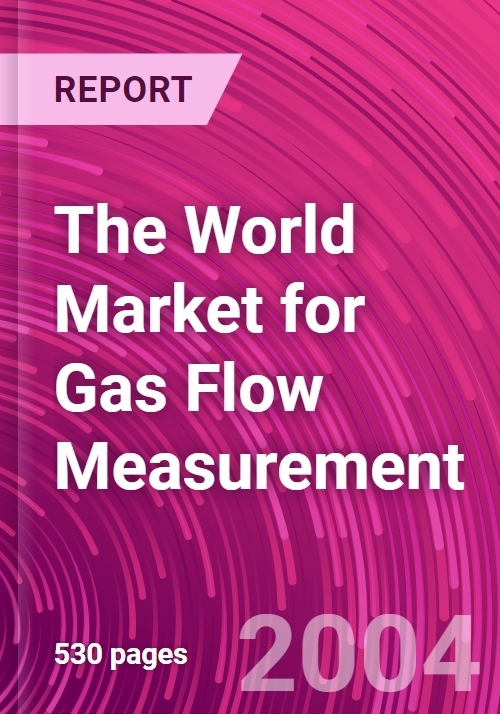 To determine market size and market shares for all types of flowmeters used to measure gas flow worldwide. To forecast market growth in flowmeters used to measure gas flow through 2008. To understand how the different types of flowmeters used to measure gas flow stack up against each other. To update information on the impact of industry approvals that are affecting the market (e.g., AGA-9). To better understand the interaction of new-technology flowmeters (ultrasonic, Coriolis, vortex, thermal) with traditional meters (DP, turbine, PD). To provide company profiles of the main suppliers of gas flow measurement flowmeters. It is especially interesting to understand how Coriolis meters and thermal meters relate to each other. Coriolis meters are used for high accuracy measurements, and thermal flowmeters excel in measuring low flows, including airflow. In what industries and applications do they compete, and where are they complementary? This study answers that question, and many other questions about gas flow measurement. Flow measurement is primarily concerned with measuring the flow of liquids and gases. Steam, which is water vapor, can be considered as a form of gas. Steam is also an important flow measurement. Gas takes many forms. Types of gas include natural gas, fuel gas, atmospheric gas, compressed natural gas, and many others. Individual gases that are especially important include hydrogen, oxygen, nitrogen, and carbon dioxide. Air is a gas, although it is a mixture of gases that include nitrogen, oxygen, argon, and many other gases. Just as water is an essential element of life, so life as we know it would not be possible without the air we breathe. Natural gas plays an especially important role in the flowmeter industry. Natural gas is an important source of fuel and energy. Like coal and petroleum, it is a fossil fuel. Like air, natural gas is a mixture of gases. These include methane, ethane, propane, butane, and other alkanes. Natural gas is found in the ground, along with petroleum. It is extracted and refined into fuels that supply a significant portion of the world’s energy supply. Compressed natural gas (CNG) has taken on importance as a source of fuel for alternative energy vehicles. Vehicles powered by natural gas are highly efficient, and emit significantly lower amounts of carbon monoxide, nitrogen oxide, and pollutants harmful to the ozone layer than gasoline powered vehicles. CNG powered vehicles are fueled at filling stations that are very much like gasoline stations, and several companies have created flowmeters specifically designed for these CNG filling stations. Gas flow measurement can also be divided into three broad categories: industrial, commercial, and residential. Industrial gas flow measurement includes flow measurement that occurs in manufacturing and process plants, including chemical plants and refineries. Commercial gas flow measurement occurs at businesses and commercial buildings such as restaurants, office buildings, and apartment complexes. This is a form of utility measurement, since these flowmeters typically measure the amount of natural gas used by the business or in the commercial building. Residential gas flow measurement refers to flowmeters that measure the amount of gas used at individual homes and apartments. Utility vs. Industrial. Meters used to measure gas or water entering a building or plant for the purpose of billing the plant for their use of gas or water are considered to be utility meters. These meters are typically sold to a gas or water utility company and installed at the building or plant by the utility company. Meters used within a building or plant for internal allocation purposes of gas, water, or other liquids, are considered to be industrial meters. They are typically sold to the owners of the plant or building itself, as opposed to a utility company. Positive displacement (PD) flowmeters are widely used for utility measurements of gas flow. One main type is the diaphragm meter. Diaphragm meters have several diaphragms that capture the fluid as it passes through the meter. Differential pressure across the meter causes one diaphragm to expand and one to contract. A rotating crank mechanism helps produce a smooth flow of gas through the meter. This mechanism is connected via gearing to the index, which registers the amount of fluid that passes through the meter. Another type of PD meter for gas flow measurement is the rotary meter. Rotary flowmeters have one or more rotors that are used to trap the fluid. With each rotation of the rotors, a specific amount of fluid is captured. Flowrate is proportional to the rotational velocity of the rotors. Rotary meters are used for both liquid and gas applications. Rotary meters are used for industrial applications. Turbine flowmeters have a rotor that spins in proportion to flowrate. There are many types of turbine meters, but many of those used for gas flow are called axial meters. Axial turbine meters have a rotor that revolves around the axis of flow. Most flowmeters for oil measurement and for measuring industrial liquids and gases are axial flowmeters. Axial meters differ according to the number of blades and the shape of the rotors. Axial meters for liquids have a different design from axial meters for gas applications. Like PD meters, turbine meters are used as a billing meter to measure the amount of gas used at commercial buildings and industrial plants. The use of ultrasonic flowmeters to measure natural gas flow gained momentum following the publication of AGA-9 in June 1998. This report from the American Gas Association gives criteria for using ultrasonic flowmeters for custody transfer of natural gas. The AGA had previously issued reports on differential pressure (DP) flowmeters (AGA-3) and turbine flowmeters (AGA-7). Since the publication of AGA-9, the AGA has also issued a report on the use of Coriolis flowmeters (AGA-11). The use of ultrasonic flowmeters is continuing to grow, both for custody transfer and process gas measurement. Unlike PD and turbine meters, ultrasonic flowmeters do not have moving parts. And pressure drop is much reduced with an ultrasonic meter when compared to PD, turbine, and DP meters. Installation of ultrasonic meters is relatively straightforward, and maintenance requirements are low. Ultrasonic flowmeters come as both inline and clamp-on configurations. Some have one ultrasonic beam, while those with higher accuracy use multiple beams. These are known as multipath ultrasonic flowmeters. Meters used for custody transfer purposes are inline multipath meters. Most of these custody transfer meters use four, five, or six paths, depending on manufacturer, to make a highly accurate measurement. Manufacturers include Instromet, Emerson Daniel, and FMC Measurement Solutions. DP flowmeters consist of a differential pressure transmitter, together with a primary element. The primary element places a constriction in the flowstream, and the DP transmitter measures the difference in pressure upstream and downstream of the constriction. The transmitter or a flow computer then computes flow, using Bernoulli’s theorem. Types of primary elements include orifice plates, venturis, flow nozzles, pitot tubes, wedges, and others. Venturis are especially suited to high-speed flows. Orifice plates are still the most widely used type of primary elements. Their disadvantages are the amount of pressure drop caused, and the fact that they can be knocked out of position by impurities in the flowstream. Orifice plates are also subject to wear over time. DP flowmeters are used to measure the flow of liquid, gas, and steam. Like ultrasonic and turbine meters, they are used for the custody transfer of natural gas. In many cases, end-users buy their pressure transmitters and primary elements from different suppliers. However, several vendors have integrated the pressure transmitter with the primary element to form a complete flowmeter. These have the advantage that they can be calibrated with the primary element and DP transmitter already in place. Coriolis flowmeters are the most highly accurate meter. However, liquid flow measurement still predominates for Coriolis meters because gases are less dense than liquids, and the measurement is somewhat more difficult. A number of suppliers have brought out Coriolis meters for gas flow measurement, however, and this is a growing area for Coriolis. One application that Coriolis has come to excel in is in measuring compressed natural gas (CNG) for alternative fuel vehicles. Here they compete primarily with turbine flowmeters. Thermal flowmeters are used almost exclusively to measure gas flow. Thermal flowmeters typically inject heat into the flowstream and then measure how quickly it dissipates. This value is proportional to mass flow. Two methods used are called constant current and constant temperature. Thermal flowmeters grew out of the use of hot-wire anemometers for research applications. Early companies to develop thermal flowmeters include Sierra Instruments, Kurz Instruments, and Fluid Components International (FCI). Thermal flowmeters excel at measuring gas at low flowrates. Measuring low flows is a difficulty for some meters, including vortex, but this is where thermal flowmeters shine. Accuracy levels are improving for thermal flowmeters, as suppliers introduce product improvements. One application where thermal flowmeters are widely used is in the measurement of stack flows. Gas flow has to be measured in smoke stacks to conform to Environmental Protection Agency (EPA) reporting requirements. Insertion thermal flowmeters are used to measure the flow of sulfur dioxide (SO2), nitrogen oxide (NOx), and other industrial pollutants. Because of the large size of the stacks, insertion thermal meters that use multiple measuring points are used for these applications. Other flowmeters used for smoke stack applications are DP meters with averaging pitot tubes, and ultrasonic flowmeters. Mass flow controllers not only measure flow; they also control it. They differ from thermal flowmeters in that most divert a small portion of the flow into a parallel channel, and then measure the flow through that parallel channel. The flowmeter then performs a calculation to determine mass flow through the entire flowmeter. Most also contain an integrated valve that is used to control flow. A setpoint is determined, usually by the user, and the valve is adjusted so that flow reaches that setpoint. Most mass flow controllers use thermal methods to determine flowrate in the parallel flow path, though some use a differential pressure principle. And some mass flow controllers are sold without the valve, meaning they are functioning as flowmeters rather than controllers. Mass flow controllers are widely used in the semiconductor industry, but many have industrial applications. It is important for a mass flow controller to know what gas is being measured, in order to insure an accurate measurement. Mass flow controllers can also be used for to measure liquid flow. Vortex and variable area flowmeters are also used to measure gas flow. Vortex flowmeters are one of the few types of meters, besides DP, that can accurately measure the flow of liquid, steam, and gas. However, vortex meters especially excel at measuring steam flow, since they can handle the high temperatures involved.